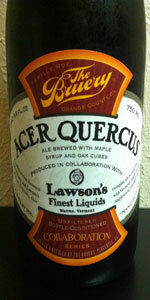 If you aren’t familiar with Lawson’s Finest Liquids yet, you should be! Run entirely by Sean Lawson, it is a nano-brewery in rural Vermont. He’s become well known in the beer world for unique beers brewed on his single barrel system, and particularly for his use of locally sourced maple syrup. We got together with Sean and developed a recipe for an oaked, smoked, mapled monster of a beer. We even smoked our own malt using the wood of the very maple trees that provided the syrup for this beer. This was a really fun beer to create and the result is a mildly sweet, smoky brown ale with balancing wood tannins. Poured into my Bruery tulip. Deep chestnut, fairly clear when not obscured by darkness. A big, fizzy cola-like head the color of torched sugar gets about an inch tall and shows nice stickiness, depositing some thin lines of lace. Maple is the leading aroma, followed by sugary toffee, smoke, butter and oak. Maybe hints of cocoa and alcohol as well. Decent, but a little sweet and maple-heavy for my tastes. Tangy dark chocolate and maple syrup lead the flavor, followed by vinous oak. A hint of smoke adds complexity, but again, it’s a bit too sweet. Tangy, boozy finish. Mouthfeel is a nice surprise. Fairly light, pinching carbonation in a syrup medium-full body. Booziness is pretty high, numbing the tongue and coming through the nostrils. I like maple, I like oak, I like smoke. If they were in equal proportions in this beer, I might like it a bit more. As it is, when the beer gets warm it just gets too sweet for me. Pours an opaque color with a nice layering of white head. Excellent retention, bubbly collar with cloudy film and patches of lacing. Plenty going on in the nose - roasted malts with touches of chocolate, nuts, rye spice, coffee beans, maple, and oak. Touches of rye spice quickly wrapped up in roasted malts. Edges of chocolate and nuttiness, a bit sweet with maple. Some oak smoothness with smoke. Finishes sticky and sweet with faint warmth. Fuller medium body, milder carbonation, chewy and smooth on the palate. Pretty interesting flavor, not really what I was expecting, but still tasty. on-tap at the ACBF in boston, 06/04/11. review derived from a few samples - lot of standing in line at the expense of other beers; not something i regret. pours a cloudy, mostly opaque mahogany tone with a nice beige head; good retention and lacing evident even in the tasting cup. nose is really inviting. big maple syrup presence right off the bat, followed by notes of smoked malt, oak, some dark fruit and a touch of rye. good dose of sweetness and yet you don't get the impression that the beer will be cloyingly sweet. oak and rye. complex and delicious. man did i want a full pour. nice, medium-bodied mouthfeel with average carbonation. overall i found AQ to be a stellar beer, hands down one of my favorites of the fest. haven't heard any definitives on what the distribution will look like, can only hope, but would love to sit down and share a full bottle of this stuff. 750ml bottle poured into a tulip. I opened this on Canada Day (the motherland) as I figured it would be suiting for the occasion but just entering notes now. A - Pours a darkish brown to swampy black. Nice fluffy wet sand brown head that does leave some good lacing. S - A distinct smokiness. Oak, sweet syrup, caramel, vanilla. T - This beer is deep in flavour. Lots of oak intermixed with the sweet maple syrup and the smoky wood. Definitely pick up some graininess of the rye on the back end and a hint of honey. Very good. M - Easy to drink, medium, slightly tacky. O - A very tasty beer, really liked this one. Glad I have more for next Canada Day! A: Pours a dark brown almost black with a nice dark tan head that fades to a ring and leaves some lacing on the glass. S: The nose is smokey and sweet with notes of smoked wood, sweet malt, and a touch of maple. T: The taste is smokey malt with a good amount of sweetness from the malt, cocoa, and a bit of tangy rye. There's a slight vanilla flavor as it warms and some maple. M: The feel is a bit thin for such a big beer but it's pretty damn creamy. O: I'd call this more of a smoked porter than a Rye beer. That being said it's pretty tasty whatever style you put it in. It could use a bit less smoke and more of the maple which is my only complaint. As you get used to the smoke you can definitely pick out more of the flavors. A - Pours a dark black color with a hint of ruby mixed in with a finger of frothy khaki colored head. The head fades down at a normal pace leaving behind some good lacing. S - Aroma is full of maple syrup with some burnt chocolate malts, some smoke, oak, a bit of dark fruit, and a touch of booze coming through. T - Starts off with some maple syrup with some roasted chocolate malts and a touch of dark fruit sweetness. Through the middle, some richer burnt malt flavor comes through with some oak and vanilla coming through as well. The finish adds some smoke to the flavor with some oak, maple syrup, and roasted chocolate malts that linger. M - Medium-full bodied with mild carbonation. Feels smooth with a sweet, warming, and lighly smoky finish. D - Very drinkable. I like the addition of the maple syrup here with the strong chocolate and dark fruit flavors. The over flavor is big and bold but pretty well balanced. Another beer shared by cbutova! Really dark reddish/brown, tan head, decent retention and lace. Dark bready malts, rye and some spice, some maple in the nose. Taste is lots of rye, maple, dark fruit, brown sugar, chocolate, caramel, toasty malt, some oak. Good mix of roasty and sweet, comes off a little dessert-y. Smooth mouthfeel, not much booze taste. Good stuff, probably best to split it, I could see it becoming tiring after 1 glass. A - Dark brown beer that's a little bit red on the sides. Has a tan head and a little bit of a collar with some minor lacing. S - Wood and smoke, really not a ton of maple syrup here which is kind of disappointing. There's a bit of alcohol burn in there but it's not bad. T - Smoke with a little bit of chocolate, slight bit of maple. Some rye and a little bit of roast with a slight bit of oak. The taste is actually pretty disappointing. Booze needs to cool down a bit, but sitting this for a bit is probably going to make the already weak maple flavors even weaker. M - Medium bodied, a little creamy, a bit hot. O - Given the collaboration and the style of beer I had high hopes, unfortunately it was a bit disappointing. Still a decent beer, but nothing particularly great. 750 mL bottle thanks to aapp, I let this one warm up a bit before pouring it into my Duvel tulip. Acer Quercus pours almost like a stout. it's almost entirely black, with just a hint of brown at the edges . The khaki colored foam approaches four fingers in height, and shows some serious staying power. The head is fairly sticky, leaving plenty of lacing. The nose is very smoky, but with a definite maple presence. There's also a faint spicy rye note lurking in the background. The flavor features those same three notes, except with rye stepping up to be the secondary flavor, and maple falling back to a light accent. All in all though, if the smoke was a little bit less dominant in both the smell and the taste the beer would really excel. As is it is pretty good though. The body was nice and sturdy, but the carbonation was a bit too much for a malt driven beer. It ended up coming off as distractingly bubbly. I thought Acer Quercus was more of a novelty than a really good beer at first, but it really came into its own as it finished warming up. .
Had this beer from a bottle upon release and honestly hated it but didn't rate it. I thought the adjunct flavors were over the top and the beer too hot. Now? Oh my God this is an amazing beer! Mellow with astonishing flavors! A: deep opaque brown with lingering lacing and top only head. T: Maple, oak, and a perfect blend of molasses, sticky malt, chocolate, vanilla, candy sugar. O: I'm angry I have none left. This truly is only of the most balanced and delicious beers I've had in a long time. I feel like it probably smelled better fresh but it didn't taste as good. Savor this beer! Bottle picked up in VT over the summer poured into my Bruery tulip. S - strange at first. lots of maple and rye spice. Very earthy and a weird yeasty aroma that is somewhat offputting. This fades as it warms, along with the maple and the smoke shows up. T - strange spice and sweetness with a weird funk in the finish. Not sure if this is the oak chips or what. this starts to fade and a really nice sweet smokiness starts to shine. M - Pretty sharp carb, medium bodied. Could definitely taste the heat. O - no particular flaw, but overall just a weird beer. It was a struggle through the first 4 oz., but then it got much better as it warmed. The beer is incredibly complex, though I wouldn't go out of my way to try again. Reviewed from notes at Friday night session of 2011 ACBF. Collaboration with The Bruery. A-This gem of a brew poursvery deep brown with amber hues around the edge of the glass. the head is creamy and sticky, very apealing looking brew. S- This is amazing! Smells of maple syrup mixed with dates. The spiciness of the rye is done perfectly in this syle bending brew. there is also a good wallop of smokiness that really sets this beer apart from anything i've ever had before. T- Taste is more of the same, though a bit more of the rye peeks through and the the finish is a bit of sweetness and again, a good dose of smokey malt. M- Mouthfeel is medium with a great creaminess. Gotta assume there is some oatmeal in this, really smooth. O- Overall, this is classified as a rye beer, butIm happy to say that I think this is one of those beers that is hard to classify, and that 's a good thing here. This Beer is nothing short of amazing. Sean Lawson is a magician! Just wish I could enjoy this on a regular basis. From what I hear it was/is only available at The Bruery and the Warren store. Pours dark brown. Not much head. maybe a touch but it doesn't last long. Smells smokey and like burnt brown sugar. No sweetness really. Overall not very appealing especially to someone who doesn't enjoy smokey beers. Tastes like smoke.... light malty sweetness but the smokiness is just overwhelming.